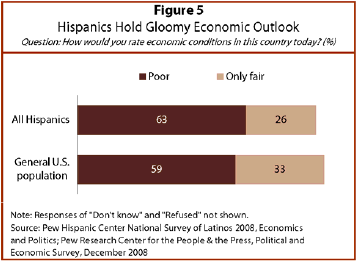 Hispanics, like the general U.S. population, have a bleak outlook on the state of the U.S. economy. When asked how they would rate economic conditions in this country today, more than six-in-ten Hispanics say that economic conditions are poor (63%), and an additional 26% rate conditions as fair. In comparison, according to a recent report from the Pew Research Center for the People & the Press (December 2008), 59% of the general public rates economic conditions as poor, and an additional 33% classifies conditions as fair. Latinos’ attitudes about the state of the economy are similar across all sub-groups—there are no significant differences in perception by socioeconomic status, or by nativity or other demographic measures.